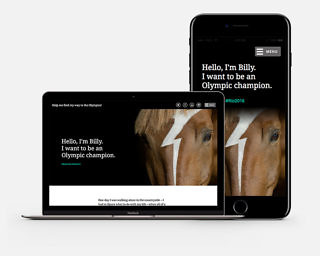 A six-month long story-telling social media campaign featuring a horse with an Olympic dream and on a mission to promote Equestrian! The goal was to make Equestrian appeal to a target audience that outside the usual viewers demographic, attracting younger and more diverse people into this horse-filled (and sometimes unknown) world. The International Federation for Equestrian Sports is the international governing body of equestrian sports. Showcase the Equestrian in a humoristic and shifted way so the general public can relate more than usual to this Olympic discipline. 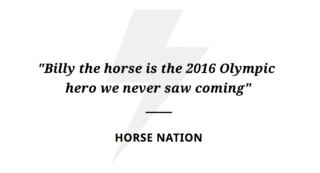 By creating a story about a genuine young horse whose dream is to win a medal at the Olympics in Rio. Tricky thing: he has no clue as to which sport he should compete in. Billy’s journey to the Olympics was showcased to the audience through a very cinematic filter: a series of short films where we pointed out his inability to adapt to any sport that wasn’t, well, Equestrian, of course. After all these trials, Billy finally realizes that being a horse might help him perform better at… Equestrian! The case study below speaks by itself, as so the case study dedicated website. As a true youngster, Billy was present on all major social media, targeting specially the USA, Brazil, Russia and China. On a daily basis, where his posts were not only about sports, but also about normal stuff like how bored he was and how he hates to wake up early, all of that in 4 languages. 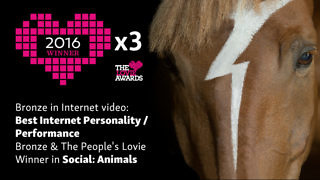 Billy’s campaign was chosen to be a finalist in the Lovie Awards and won 3 awards! He was also invited to compete in the Equus Film Festival, which is dedicated to all things Equestrian, and he won a price. Bronze medal winner in Social Animals and Best Internet Personality, plus a People Choice Awards.